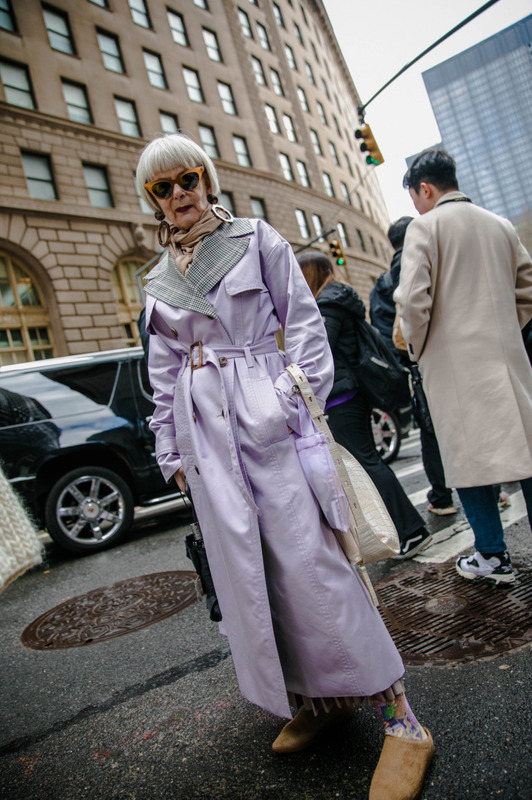 Let's go look at someone else's windows, alight in leaps of colour, special effects, riotous garb: street shots of persons who were at February's New York Fashion week. Stretch the eye, shake it up! I felt giddy after over 271 shots, stretched, cheered, vaulted out of winter's greyness; I hope the same for you. The link is to a feature in The Cut; photos by Nicky Zeng. As one young woman's barrette said, "Damn!" They had me at "more fun to wear any color but black"! Thanks for the pick-me-up. I love black (Livia is black) but there are other colours. What fun! Lots of hair adornment! Lots of colorful faux fur! And some looks that we're downright pretty. Thanks, I feel better! I love green, but not too yellow. Was happy to find a couple of nice organic t-shirts in pretty greens; will be looking forward to wearing them, but that will be with jackets for quite a while yet. (Livia has green eyes). The woman in the "keep fashion weird" t-shirt (slide 175) is a blogger friend. Her blog (not surprisingly) is called "Fashion Should Be Fun." :-) Happy to see so much diversity, including some fabulously stylish plus-size women! lagatta: To see the full shot, select the four-panel view. See under text, "The Cut" icon, it is to the immediate right. Bet h: I thought of you especially! Leslie: Green clothes are not easy to find. I don't think they ever date but like other colours sometimes, you see them more. I recently read a colour specialist who said, "You can wear any greens together, but not any blues". There certainly are some audacious colour combinations among this crowd! It encouraged me to loosen up! I have blue-green eyes. Green makes my eyes flash; bright blues kill this. And what was once almost black hair quite silver, (by way of the "reddish-black" popular in artsy circles) but lots of dark cool streaks, especially around the edges. Several family members have greyed early, but my youngest uncle has a full head of silver hair at 84. Thanks for the viewing advice. I think the bits of views annoy me because I'm short and remember being in so many crowds - as at festivals - where I'd only get such a glimpse of the goings on. It is so much better with the full shot, and clicking on those if I want more detail. In many shots one can see that it is still quite chilly there, with bits of snow, sleet and ice. Loved all of the cuddle coats and the gorgeous tiny purses. I see that barrettes in large numbers are a trend. But how cold so many of the subjects looked on the chilly NYC streets in February wearing flimsy frocks and plunging necklines . I think that on average the guys came out looking by far the best - colourful, stylish and warm. Araminta, I loved the whole shoot, but seeing the full frames revealed how freezing it was underfoot. I love to be warm.